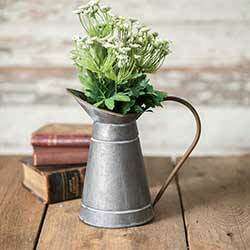 Entertain in style with one of our pitchers or creamers, perfect for serving up milk, lemonade, or water! Both glass and ceramic options in a variety of styles. 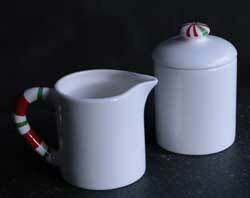 Candy Cane Creamer & Sugar Set, by Tag. Sweet, hand-painted earthenware pottery, white with red and green candy cane stripes! Microwave/dishwasher safe. Creamer has candy cane handle, and sugar has candy button top. 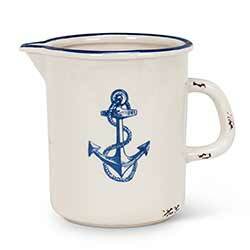 Creamer measures 3.5 inches high and 3.25 inches in diameter, and has an 11 ounce capacity. Sugar measures 4.75 inches high and 3.125 inches in diameter, with a 1.375 cup capacity. Coordinating candy cane pottery also available! 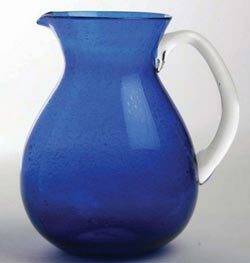 Cobalt Bubble Glass Pitcher, by Tag. Tag's collection of hand-blown glass barware comes in multiple pieces and 7 different colors. Each piece is individually unique, and suitable for any occasion. Designed with hundreds of miniature bubbles floating inside the glass, forming unique patterns and optical effects. This is for the Pitcher in the Cobalt blue color. Measures 9 x 8 x 5 inches. Hand wash. Other pieces available! 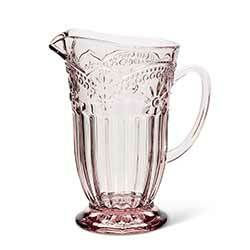 This pretty pink vintage-style pitcher is the perfect way to usher in spring at your next special event or outdoor party. 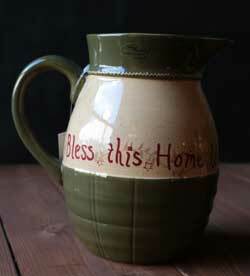 Great for serving up water, lemonade, or iced tea! Set of three baskets made of woven corrugated metal for an urban country look.